Back in 1895 a gentleman by the name of William G. Morgan, a physical education director at the YMCA, was looking for a game for the older members of the ‘Y’. Taking some aspects from each of basketball, handball and tennis, he designed this to be an indoor sport, to be played by any number of players, that was less rough than the other sports, thus the creation of Volleyball. 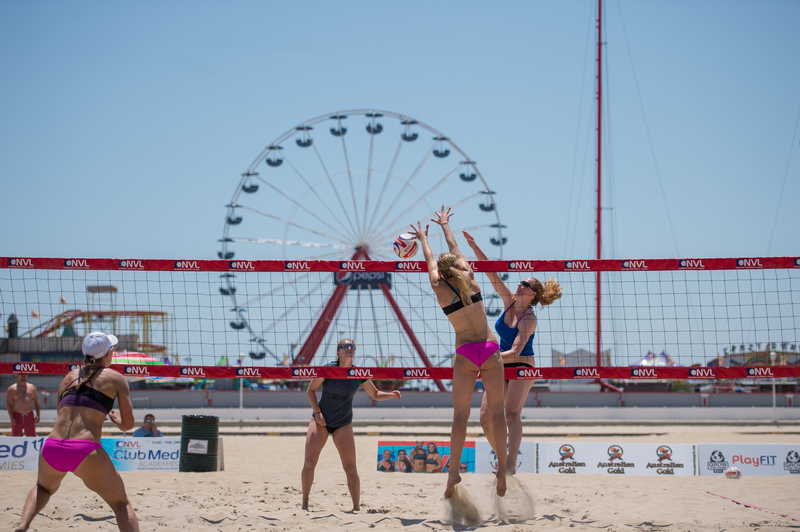 The National Volleyball League (NVL) made their Ocean City Maryland debut this last weekend, May 29th – 31st, 2015, and for beach volleyball fans it was a chance to meet and watch some of the best of the best. In 1920, in Santa Monica California, jetties of sand that were a vacation spot for many, volleyball nets began to appear as a pastime to those that had known the indoor game. By 1922 many local beach clubs began putting up nets as the game was growing in popularity, in 1924 the first tournaments began. Paul “Pablo” Johnson, an indoor player of Santa Monica Athletic Club, was waiting for other players to arrive for their scheduled game, and tired of waiting, started playing with the couple other players that had shown up on time. The game of Beach Volleyball, thanks to “Pablo”, changed forever, and became an Olympic Event in 1996. This year the NVL has 8 tournaments around the United States, 3rd event of the 2015 season and the 1st time in Ocean City Maryland. Learn more about the National Volleyball League on their Website, on Facebook and follow the hashtag #NVLOceanCity on Twitter and on Instagram. Visit the National Volleyball League website for a list of all the winning teams… Click Here! And, to the Town of Ocean City for all your work and support!